Don't get outdated....choose from our exclusive Designer range today! 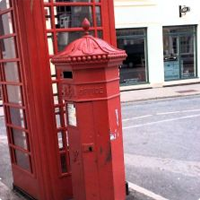 The Victorian reign saw various postbox designs, from the unsuccessful square steel boxes, to the cast iron cylindrical boxes which we continue to see on our high streets today. Square steel boxes are useful for commercial post, as they hold a large capacity, our parcel box is a particular favourite from the range. Royal Mail estimate that there are over approximately 100,000 public postboxes in the UK today, not including residential letterboxes! Post is transported and delivered daily, a form of communication which has remained popular for hundreds of years. Tired of sending emails and mobile texts....why not send a letter or two for a change. Our modern letterbox designs are secure and whether resistant, the majority manufactured from stainless steel to match the exterior of modern properties. Or perhaps our latest designer letterbox range takes your fancy, an exclusive futuristic collection, offering unique colours!